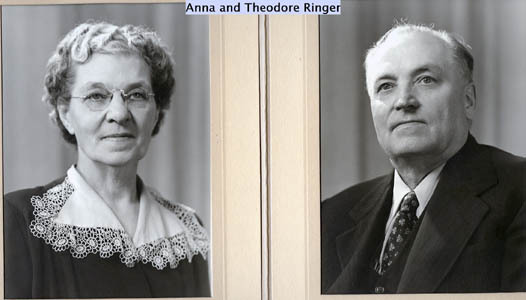 This page will discuss the family of Theodore and Anna Emela (Johnson) Ringer. The following articles that are presented below were provided by Mary Lou Ringer, wife of Leo Ringer. You have heard about the "Life of Riley" so I thought perhaps some time our son and daughters and grand-children might want to know a few things about the life of Theodore Otto Ringer, he vas born on a farm 6.5 miles southwest of Wisner, Cuming County, Nebraska in a log house March 28. 1879. He attended country school near his father's homestead and finished with the 7th grade. He now weighs 185 pounds and is 5 foot 3 inches tall. He remained on the farm with his father until 1893 and then took employment in a general merchandise store in Wausa, Wisner, and Plainview, Nebraska and in Denver, Colorado. In June 1901 until June 1902 he took a General Business Course at Highland Park College in Des Moines, Iowa. then, be entered the general merchandise business in Tilden, Madison County, Nebraska and continued in business for himself until the spring of 1906 at which time he sold his business to Mr. Hansen, who formerly worked in a general store at Tilden. 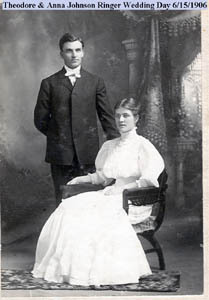 On June 15, 1906, he married Anna Emelia Johnson, a school-teacher of Meadow Grove, Nebraska, but her house was in Stanton County. She was born in Union Creek Precinct south east of Stanton, Nebraska. 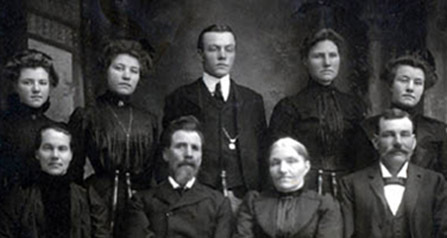 They took a trip to Denver, Colorado Springs and Pikes Peak and then returned to Tilden to look after Insurance and Real Estate interests until June 1908 at which time they moved to Stanton on her father's farm and took over management until March 1, 1910. 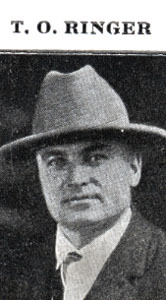 In the fall of 1909 from October until January, Mr. Ringer also took a course of auctioneering and salesmanship at the Missouri Auction School located at Trenton, Missouri, They returned to Tilden early March 1910 and Mr. Ringer entered the Insurance, Real estate and Auction business and managed some farms and property until June 1921. At that time he took over the management of the Norfolk Live Stock Sale Company and was also elected Secretary-Treasurer in June 1937. He continued in this capacity until September 1942 at which tine he sold his interests and returned to the business of farm management, appraisals and sales. When his son Leo was discharged from the U. S. Army Air Force, he became a member of the firm Ringer & Ringer, 408 Madison Avenue, Norfolk, Nebraska. Home address since 1928 was 1104 South 3rd street, Norfolk, Nebraska. William Ringer, Father of T. 0. Ringer, was born at Stargodt Pommern, January 28, l836. He was the son of William Ringer; his mother died when he was but two weeks old. In 1872, he cane to West Point, Nebraska and engaged as a laborer; his first work was to help build the West Point Court House. The following year (1873) Mr. Rionger homesteaded a quarter Section in Section 28 Wisner Township. He immediately built a log house and started to make other improvements. His last farm residence was built in 1881 of brick which he burned on his own farm. For seven years he carried on a brick yard and many neighbors buildings were partially constructed of brick; manufactured by him on his homestead. Emil Fred, born February 20, 1874. Bertha Adeline, born August 9, 1883. The following is the obituary for William Ringer, father of T.O. Ringer. William Ringer died at his residence, this city, last Monday morning at ---- o’clock from heart failure. His heart had been affected for some time and he had used the ordinary stimulants as a relief from the defective heart action that caused him discomfort at times. There was nothing in condition the previous day to cause any thought that he would not see the light of' another day. When the attack came on he arose from his bed and awakening Mrs. Ringer told her that he was dying. She hastened to summon aid from neighbors and telephoned for Dr. Riley. Upon returning to their home he was Lying upon his bed and unconscious, and before the arrival of the physician he had passed away. The funeral took place Thursday afternoon, Rev. A. Ollendorf conducting services at the home at two o’clock followed by a sermon in the Christus German Lutheran church, of which the deceased was a zealous member. The body was interred in the family lot in the Wisner cemetery, a large concourse of old friends and neighbors attending the obsequies. Mr. Ringer’s death removes from This community another of its pioneer citizens and a man that was a familiar figure here for almost forty years. He was born January 28, 1836, at Schoenebeck, Pomerania. In 1836 he moved from his native place to West Preussen, and there was united in marriage with Anna Finck in 1862. Ten years later they emigrated to America and settled upon a homestead southwest of Wisner, which was the family home until 1896 when he retired and came to live in town. Mr. Ringer Was a man who enlisted the entire confidence and high respect of all who knew him, and will be missed from the lessening ranks of the old settlers in this part of the county. He is survived by his faithful and devoted wife, seven sons, three daughters and eighteen grandchildren. Mrs. G. C. Benning of Battle Creek, Nebraska. All were present at the funeral except William and Henry. He also leaves a brother, Edward Ringer of Neligh and half-brother Albert Ringer of Omaha. The following is the obituary for Anna J. Ringer, mother of T.O. Ringer. Mrs. Anna Julia Ringer, widow of William Ringer, died at the home of her son, Otto R. Ringer, on Sunday --- She had passed several months of weary helplessness after a stroke of paralysis, until death came to her relief. The funeral was held Thursday afternoon of last week, Rev. W. Krauleidis conduction the services in the Christus German church, where the deceased had been a devout and zealous worshipper and member. A large concourse of friends attended these services, and followed the body to its place of interment in the Wisner cemetery. Mrs. Ringer, whose maiden name was Fink, was born July 28, 1836, at Wangarken, West Prussia, Germany, and reached the age of 78 years, 3 months, and 3 days (this means she died April 25, 1914, if I did it right). 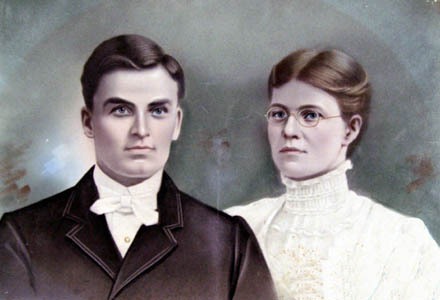 She was married to William Ringer in 1862, and ten years later they emigrated to this country, locating on a farm southwest of the new town of Wisner. 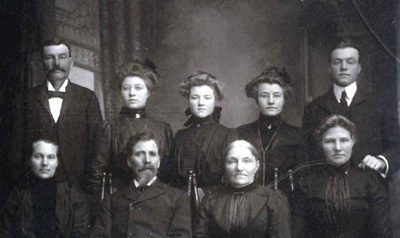 After twenty-four years of busy and successful life on the farm, they retired to a home in Wisner ion 1896. Mrs. Ringer was bereft of her husband, by death, four years ago (this means he died c.a. 1910). Mrs. G.C. Benning of Battle Creek, Nebraska. There are also twenty-four grandchildren and five great-grandchildren, representing the second and third generations of the descendants of the deceased. Iowa, and Charles Ringer of St. Joseph, Missouri. Emelia Ringer Wienke — born in Germany, one of a family of fifteen children, she was brought to this country at the age of nine months. Her parents Homesteaded in Nebraska in the days of sod houses. One of the outstanding events of her childhood was going to the circus and the aftereffects of that marvelous sight. Her father had an old horse for the children to ride and Emelia, aged nine, aspired to make a circus pony of him. During the early stages of the performance she fell off and broke her elbow but never revealed the event and the arm healed in a stiff position. We wonder just how much more work she could have accomplished had this accident not occurred. After her marriage to Frederick William Wienke and the Children were born, they moved to Montana, where homesteads were attracting people from all the middle states Mr., Wienke was a carpenter, building for himself a large granary for temporary lodging. While working at his trade and his sons did the work on the farm. Land seekers needed a boarding place, so Mrs. Wienke turned her two room building into a road home, at one time rooming and boarding 25 men. She did all the cooking herself, baking bread and making butter included. In 1923 she and Mr., Wienke arrived in Thousand Oaks, buying from Culver and Sturgis the first lots sold in this subdivision. They developed their place until now it consists of three homes, Mrs. Wienke occupying the first house built by her husband. Both Mrs. Wienke and Mrs. Fields are ardent church workers and the whole family fine neighbors and community builders. In the middle of the nineteenth century the German states faced a time of destructive revolution, bad crops, and avaricious landlords. During that period the tide of emigration to the United States became a flood. Between 1841 and 1860 nearly 3.5 million came from Germany and Ireland, many to help develop the Middle West. Most European immigrants, no matter what their country of origin, left from one of two German ports, Hamburg or Bremen. While waiting to board ship, they stayed in an inn designed to house them and their families, everyone had to undergo a medical inspection, because steamship companies had to bring rejected immigrants back at company expense. If lice were found, the immigrant and his bundles were fumigated. The ocean voyage was probably in a 6-by-6 foot cabin with triple-decker bunks and five other passengers who were sick all the way. After 1855 immigrants were processed through Castle Garden, a converted amusement park on the tip of Manhattan. A typical homesteader brought his family and his possessions to the Plains in a covered wagon; if he came in the 1870's, after the railroad was in service, he might have some of the heavier, bulkier belongings shipped to the station closest to his claim. Usually, he would have with him a few dishes, clothes, and treasured personal belongings, and, of course, farm implements. He might be lucky enough to own a few head of livestock, including a cow to provide milk for the younger children. As soon as the homesteaders wagon rolled onto his claim, he would start looking for the best place to build his house. When it came to material for home-building, there were virtually no trees. The pioneers needed to look no further than the earth beneath their feet. The tough prairie sod of Nebraska, the. Dakotas, and Kansas was substituted for timber, and the sod-house frontier came into being. 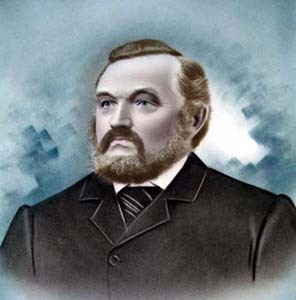 William Ringer, one of the representative farmers of Wisner township, Cuming County Nebraska, whose farm home is on Section 28, was born at Stargard, Pommern, Germany 28 Jan 1836. He is the son of .William Ringer. The younger Williams mother died when he was two weeks old. When a small boy, William worked with his father at brickmaking. In 1872 he came to West Point, Nebraska and engaged as a laborer. His first work was done in helping to build the courthouse. The following year he homesteaded a quarter-section of land in Wisner township, the same being his present farm. He built a small loghouse and began to make improvements, although he possessed but five dollars in money and had no team. His first and third crops were destroyed by grasshoppers, but he was not the kind to be disheartened, and kept pressing forward, believing that deliverance would come. He now owns (or did) four hundred and eighty acres of choice land, with good improvements and all well stocked. His residence was built in 1881-, of brick, which he burned on his farm. For seven years he carried on a brick-yard, from the product of which many neighboring buildings were wholly or partially constructed. He was united in marriage 2 January 1662 to Anna Julia Fink, Politically, he affiliated with the Democratic Party, and in religious matters is connected with the Evangelical Lutheran Church. 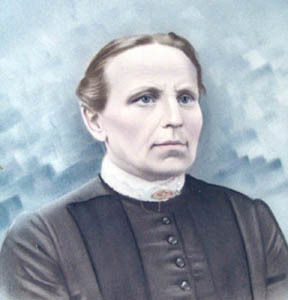 Anna Julia Fink was born at Wanglarken Kreis Schwetz, Germany 28 July 1836. 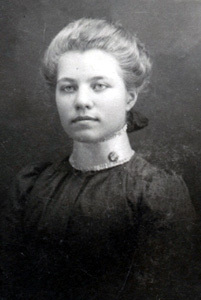 She and William Ringer were married 2 Jan 1862, The couples eighth child, Emelia Caroline Ringer, born 10 Jan 1872 in .Westprausen, Germany was married 10 Jan 1889 to Wilhelm Frederick Wienke. Wilhelm was born July 1860 in Germany. Mary lou Ringer, wife of Leo Ringer, showed me the three pictures posted below when I visited her in 2004. These are actually paintings and they appear to have been made by the same panter, probably commissioned at the same time. The first picture is of T.O. and Anna and is said to have been painted at the time of their wedding June 15, 1906. I think the second and third pictures are of T. O. Ringer's parents, Anna Julia Fink Ringer (1836 - 1914) and William (1836 - c.a. 1910) but there are no captions on the paintings.